Brain imagery now allows us to see some of the developmental milestones achieved by the human brain as it grows and matures throughout the early stages of life, confirming in pictures what parents and those who work closely with youth have long found to be true: adolescence is a period of gradual maturation. Hard science demonstrates that teenagers and young adults are not fully mature in their judgment, problem-solving and decisionmaking capacities. In the spring of 2006, the Coalition for Juvenile Justice (CJJ), with grant support from the Office of Juvenile Justice and Delinquency Prevention (OJJDP) at the U.S. Department of Justice, devoted a national conference to explore how juvenile justice systems can work more effectively with youth and families in light of growing and more refined knowledge about the nuances of adolescent development and maturation. Some of the ideas about applying research to juvenile justice practice are contained in this brief report -- the second of two resource papers derived from presentations and discussions held at and since the conference. 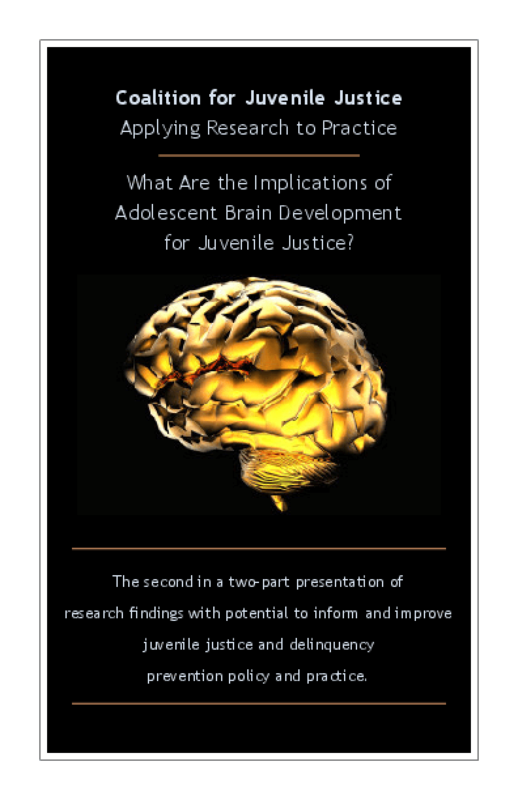 Title: Applying Research to Practice: What Are the Implications of Adolescent Brain Development for Juvenile Justice?